Jonathas de Andrade, O Peixe [The Fish], 2016. 16mm film transferred to 2K video, 37 minutes. © Still: Jonathas de Andrade. Repro: Binder & Haupt. One of the standout works in the biennial is Lawrence Abu Hamdan’s devastating sound installation Saydnaya (the missing 19db), 2017. Over 12 minutes in a darkened room containing only a mixing desk and a light box, he draws you into life in the notorious prison just north of Damascus, where 13,000 people have disappeared since 2011. Survivors describe the horrific conditions they lived in – blindfolded, kept in the dark or forced to cover their eyes and punished for the slightest noise. This made them hyper-sensitive to sound. In a hellish environment where a cough could mean being beaten to death and only the newcomers screamed, stories of prisoners’ acts of humanity to each other in the face of unbearable cruelty resonate powerfully. The work is painful to listen to but completely engrossing, as the artist records traumatic memories recalled through sound not sight, creating a vital body of evidence. In his practice, Abu Hamdan works as a forensic audio investigator for human rights violations. This current investigation was carried out in collaboration with Amnesty International and Forensic Architecture. As the prison is closed to independent observers, these testimonies are the only resource for documenting the abuses taking place. The artist and witnesses have reconstructed the architecture and events of their prison experience through sound. 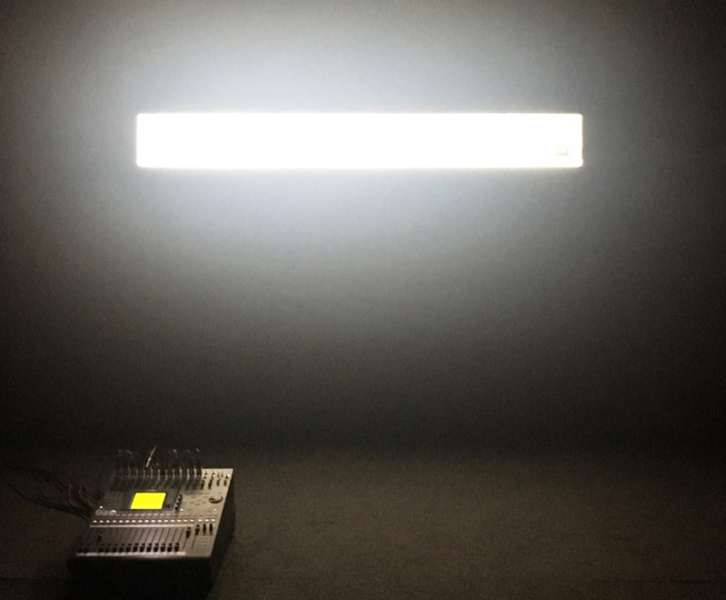 Using a process of ‘echo profiling’, Abu Hamdan was able to determine the size of cells by playing former prisoners different reverberations and asking them to match them with sounds they remembered hearing. 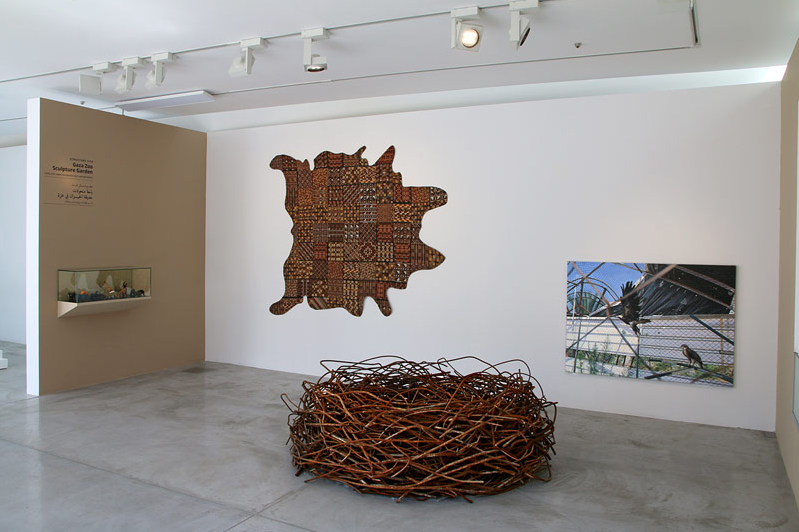 You can see another stage of this project at Abu Hamdan’s current solo show at Maureen Paley until 28 May. Saydnaya (ray traces) consists of a series of projected diagrams illustrating the unseen architecture of the prison based on the accounts of its survivors. Ray tracing, the artist explains, is a tool used in digital visualisation in architectural design to map acoustic leaks and each line speculatively models the way a sound wave reflects off the walls, floors and ceilings to produce an architectural ultrasound scan. Visitors walk amongst the projected lines that resemble the bars of a cage. 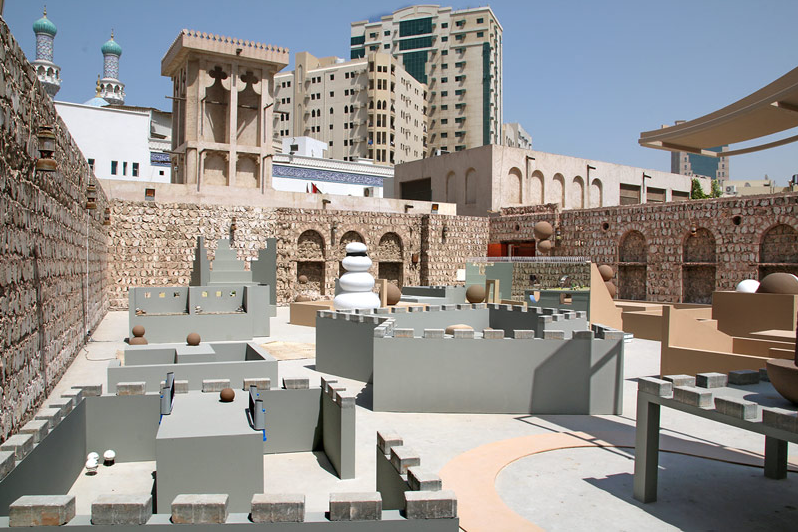 The main biennial spaces are clustered around three Squares: Al Mureijah, Calligraphy and Arts. The first is a maze of purpose-built climate-controlled modern art spaces, designed in keeping with the local style and proportions and the others are older, traditional buildings with inner courtyards. Walking between spaces you navigate numerous mosques and high walls constructed of coral rock that cast a welcome shade. Looking up you might see dusty glass towers, characterful 70s apartment blocks or the Corniche lined by moored dhows and abras. It is currently 40 degrees and humid, so you dive from one air-conditioned space to the next clutching your water bottle. There are also places to grab refreshment such as the biennial’s own Fen café and the lovely Ratios on the Corniche. Venues to be reached by car are the new complex Al Hamriyah Studios, and old landmarks, The Flying Saucer and the Old Planetarium. 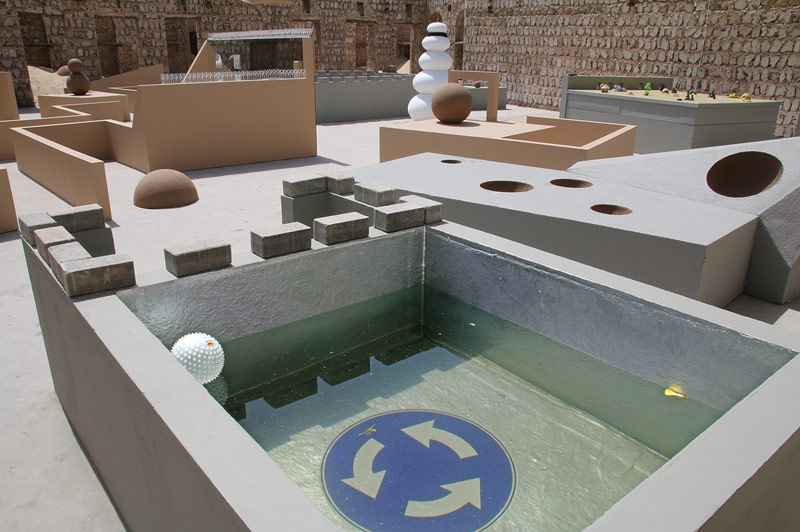 There are also offsite projects for the biennial in Dakar, Istanbul, Ramallah and Beirut. A dream-like sculpture installation in a walled outdoor space by Donghee Koo, Way of Replay II (Off Peak), 2017, plays with the architecture of the biennial and is deeply satisfying to walk through. It contains perfectly balanced low walls and objects that remind me of chess pieces or topiary, sometimes half submerged in sand. In a similar space next door is Dineo Seshee Bopape’s +/- 1791 (monument to the Haitian revolution 1791), 2017. In contrast to its neighbour this work feels chaotic, or organised according to a ritualistic logic we are not party to. In fact, it was inspired by a South African protest song. 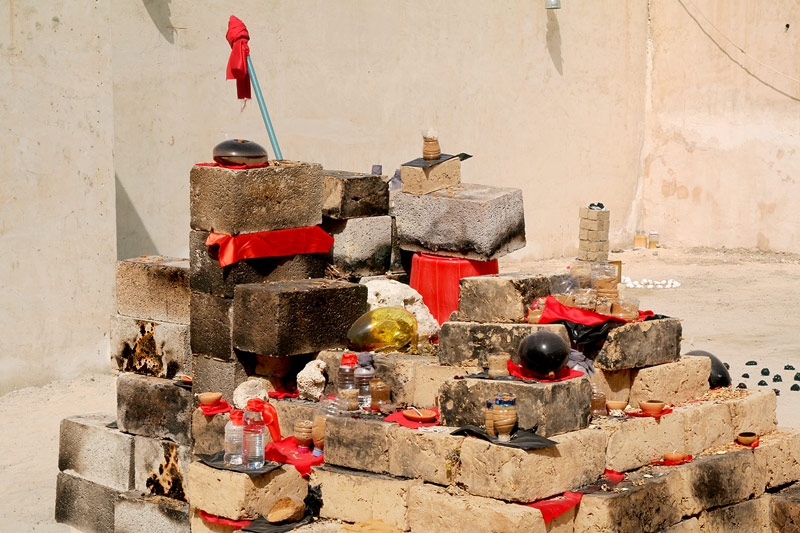 Piles of bricks stand in the sand, as shrines for a range of objects, including shells, plastic bottles containing seawater, crystals and scraps of red cloth. The title of this intriguing work refers to the fact that the Haiti slave revolt was apparently sparked by a voodoo ceremony. It is a meditation on how revolutions emerge from personal and spiritual practices before entering the public realm. A strong recurring theme in the biennial is human’s antagonistic relationship to their natural environment, be it plants or animals. 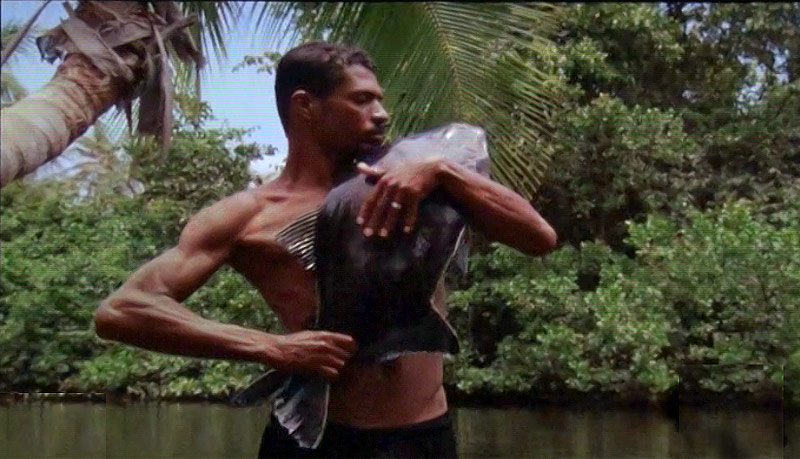 In Jonathas de Andrade’s O Peixe [The Fish], 2016 Brazilian fishermen are filmed in close-up clutching fish they have just caught to their naked chests, caressing them as their life drains out. Allora & Calzadilla’s video installation The Great Silence, 2016 relays the imagined conversation of parrots in Puerto Rico who live near the Arecibo Observatory, a listening post for extra-terrestrial signals. These endangered birds wonder why humans don’t listen to them instead, rather than destroying their habitat, the Amazonian rainforest. 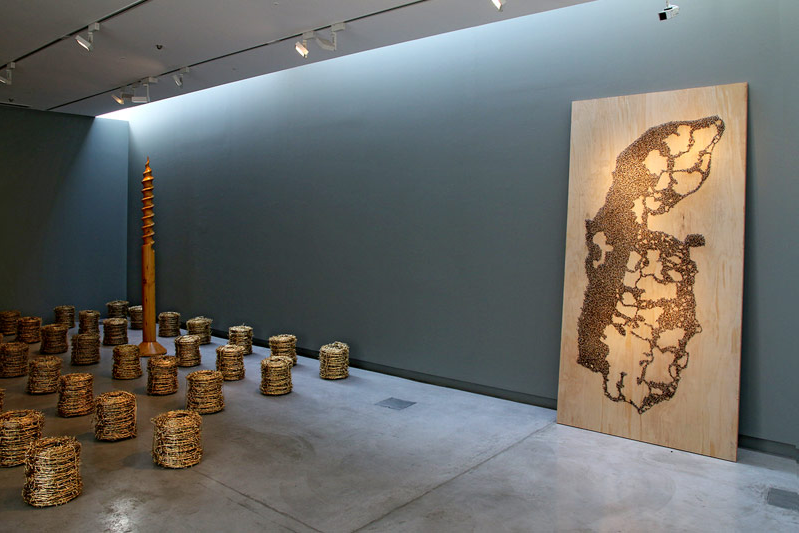 Two of the three UAE-based artists in the biennial, Hind Mezaina and Vikram Divecha focus on planting practices. For Beej, 2017 Divecha invited Pakistani municipal gardeners to bring agricultural seeds from home, where they work as farmers, to Sharjah to plant them in an urban roundabout. Meanwhile, Hind Mezaina’s Dubai Gardens, 2017 explores the lived experience of Dubai’s green spaces, both domesticated and natural, and the ways that inhabitants interact with them. 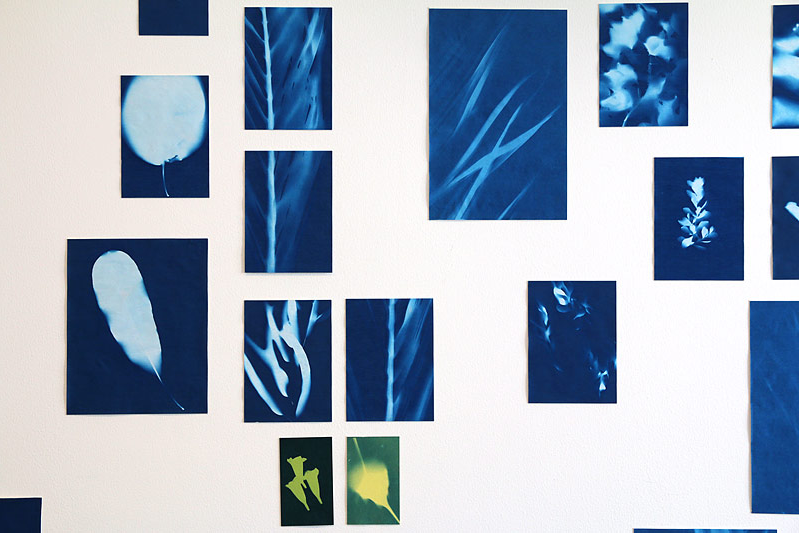 She has created a series of 110 cyanotypes of the plants she encountered, using this nineteenth century technique of camera-less photography. These spaces can serve as both refuges from the relentless city traffic, or as borders. 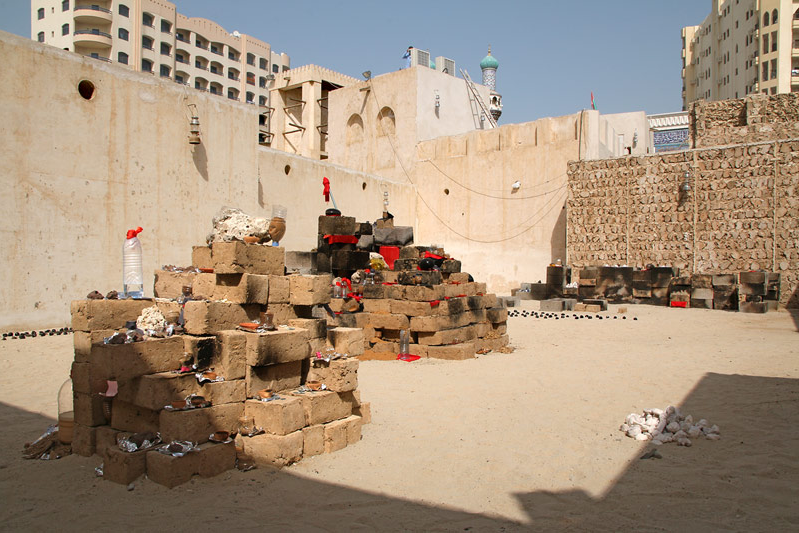 In her practice, Mezaina explores the accelerated change in Dubai that she has witnessed while growing up there through a ‘visual archaeology’ grounded in presence and observation. She presents a nuanced view of a city often subject to tabloid headings. The slow process of making these images seems to invite us to reflect more carefully on what we think we already know. 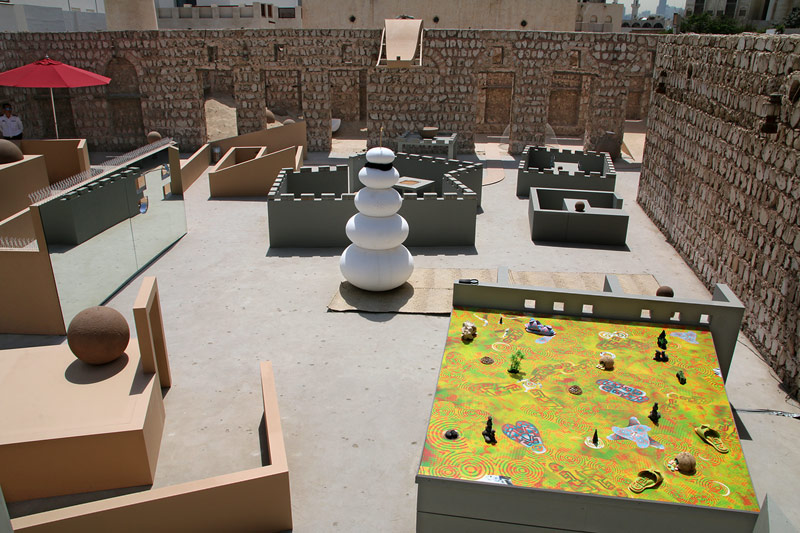 There were fruitful juxtapositions made in Sharjah’s public space. 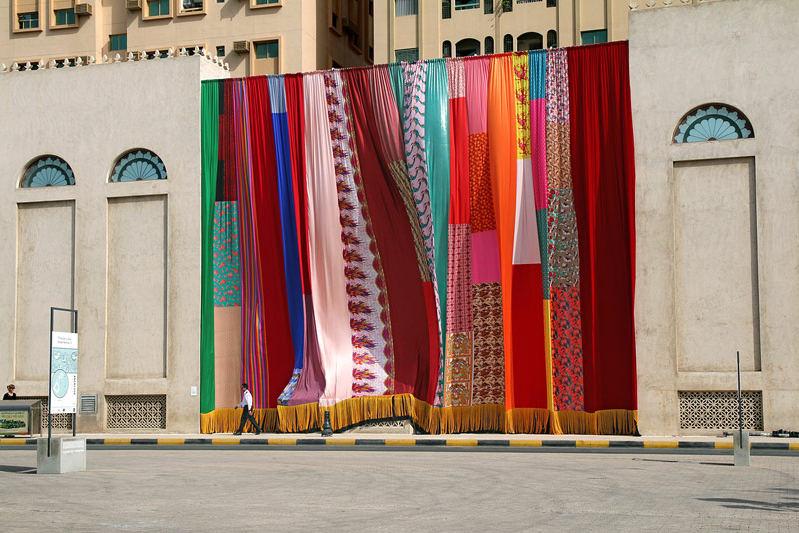 Joe Namy’s colourful installation Libretto-o-o: A Curtain Design in the Bright Sunshine Heavy with Love, 2017 is a huge curtain made of a patchwork of cloth sourced from the nearby souk and sewn together by local tailors. This block of colour contrasts magnificently with the bleached out the museum it is hung on and the intimidating wall of 600 police riot shields making up Collectivism, 2016 by Rain Wu and Eric Chen opposite. For me, Namy’s theatrical backdrop offers a gesture of hope, that even the most regimented public space cannot withstand temporary informal uses.